Homemade apple pie—three mornings in a row. Who knew? Okay, probably everybody but me. I don't mean about eating apple pie for breakfast—I've been doing that since I was little. My mother felt bad eating pie for her breakfast and not letting us kids have any, so she did. And it's not all that bad for you, especially with a nice cold glass of milk, though of course a big scoop of vanilla ice cream is a lot more fun. What I'm talking about is the pie crust. I've been making pies for 24 years, always with a homemade crust, and this was the first time I mixed up the pastry in my big fancy food processor. Oh my gosh, have I been missing out. It took about 10 seconds! And it was perfect. I also made my first all-butter apple pie crust, but only because I didn't have any organic shortening or homemade lard on hand. A tablespoon or two of lard adds a really nice flavor, but go easy because too much tastes like bacon pie. In the bad old days, I swore by a Crisco crust. I made the streusel topping in the food processor, too, and that only took about three seconds. The texture came out a little finer than I like, though, so I'll probably go back to doing it by hand with a pastry cutter. But still. That instantaneous crust! I see a lot of pies in our future. My very favorite pie is blackberry—which I haven't had for years because the weather and the wild blackberry brambles around here are so wishy washy—but apple is a very close second. My mother always made apple pie with a streusel topping rather than a double pastry crust, and that's what I make, too. The regular kind always seems so boring to me in comparison. This apple pie is my More, More, More version of my mother's recipe (more apples, more topping, more crust), which I've been refining over the years—and which sold like crazy in the little bakery cafe I had for a while before I moved from California to Missouri. I need to do a little more experimenting with the current version, and then one of these days I'll share the simple recipe, which comes with a couple of stories, that include a marriage proposal and why I now call it 500 Mile Apple Pie. I've also been meaning to try Alicia's amazing looking Sour Cream Apple Pie for two years. It looks similar to mine, only with sour cream and eggs and vanilla. Uh, yeah. And I've always wanted to make an apple pie with raisins in it. I think I need to go find a bushel of apples. We obviously haven't been eating enough pie around here. In the meantime, how about a giveaway? 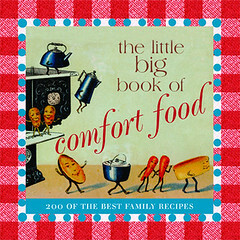 The Little Big Book of Comfort Food: 200 of the Best Home Recipes (hardcover, 350 pages, cover price $24.95; new copies start at $7.66 at amazon.com) might just be the cutest cookbook ever. It features over 100 charming, full color vintage illustrations, along with recipes for everything from Buttermilk Pancakes, Banana Oatmeal Muffins and Hearty Corned Beef Hash to Chicken Fried Steak, Mushroom Barley Soup, Creamed Spinach (made with fresh spinach) and Hot Chocolate with Whipped Cream. It would make a really sweet gift. And then there's the dessert section, which includes eight kinds of pie: banana cream, chocolate peanut butter, lemon meringue, mocha toffee ice cream, pecan, pumpkin, strawberry ice cream, and an apple crumb pie similar to mine. There's just something so homey and cozy and wonderful about pie. Even the word pie makes me happy. And being a movie buff, I love when movies feature pie. We watched It's Complicated again the other night, and of course I loved all the bakery and food scenes (Nancy Meyers makes the best movies), including the one where Meryl Streep's character baked those three gorgeous pies for her girlfriends. I really need to dig out our battered old copy of Michael, a perennial favorite that has the most wonderful pie scene—and a pie song. And then there's Waitress, which I started watching without knowing that it was all about pie. Since so many of you already shared your favorite comfort foods back during this giveaway (those were really fun to read), this time let's limit the subject to pie. To enter, simply leave a comment in this post telling us something about pie. Do you know any other movies with pie scenes? What's your favorite kind of pie? Got any good childhood pie stories or memories? If you've shared a pie recipe on your own blog, you're welcome to leave a link to the post in your comment. Let's talk pie! One entry per person, please. I moderate comments, so if I'm away from the computer it may be a while before yours actually appears. You can enter through next Friday, October 22nd, and I'll announce a random winner a day or two later. Please make sure I have a way to get a hold of you to tell you that you've won; for example, if you have a Blogger profile, is it public and does it list your correct e-mail address? Thanks to the publisher, Welcome Books, for providing this giveaway copy. Sorry, but the book can only be shipped to a U.S. address. The contest is over; thanks for all your fun entries! Farm Fresh Eggs of course! © FarmgirlFare.com, the sweet toothed foodie farm blog where I especially love to watch the director's commentaries of Nancy Meyers' movies, and on Something's Gotta Give (which included two versions, one with Jack Nicholson and one with Diane Keaton—so of course I had to watch them both), Nancy said that actors love how she always has really good food in her movies, but the problem is that they never stop shoveling it in long enough during filming for her to get good shots of them when they aren't chewing or have a fork in their face! Wow great memory flashback - when I was growing up we lived in New Mexico a long while and my mom was from Texas. For visits and holidays - we'd get up before the sun, my brother and I would both sleep until my parents were ready to Stop For Breakfast - we usually stopped in the same small town just over the state border at a place that happened to have hot pies coming out of their ovens at the time we'd stop. Everyone in the family got to order a big slab of warm pie - let me tell you - ain't nothing like a warm Pecan Pie for breakfast! Good memory - and pie is a wonderful thing - ultimate comfort dessert right after rice pudding! One of my first jobs after I left my parents' home was at a California chain diner called Baker's Square-- which sold a bunch of different kinds of pies. We were pretty strict about freshness, so everyday there were more than a handful of perfectly good pies that had to be thrown away. I (and my 4 roommates, who also all worked there) were broke and hungry, so would take home the discards. Often our fridge was empty but for 5-6 different kinds of pie. We lived on the stuff for a year! Mmm, pie. Oh man, I made a strawberry pie in the spring, the day before I started to count calories. So I added up all the calories in the pie. And decided that if I didn't eat anything else, it would be perfectly healthy to eat THAT WHOLE PIE in one day. Hey, there's fruit...dairy...cereals...all in that pie! My beau (now husband) and I decided long ago that Thanksgiving would be our holiday without family. We would invite people who were stuck in town, didn't want to see their family, or who were townies and wanted to come for second dinner. One year we ended up with my parents coming to dinner. Our regular ner do well friends did really well at keeping the bad language and table manners under control, at least until the parents left. Then all the guys proceeded to pull the crumb topping bit by bit off the remainder of the apple cranberry pie. It is one of my favorite Thanksgiving memories. We were all waiting for my parents to leave to stick our hands in the pie. I love pie for breakfast - especially apple. My favorite pie recipe came to me from a substitute teacher in my school. Her husband worked in the produce department of a local grocery and she brought in the best pumpkin pie I had ever eaten. She brought in the recipe the next day. The pie begins with a sugar pumpkin and incorporates cream cheese into the filling. The cream cheese cuts some of the sweetness of the pie filling and it is just fantastic. I lost the recipe for several years after moving only to find it two years ago. THis year I plan on sharing it with my Culinary Arts high school students. Pie. Such a yummy topic for conversation. I do enjoy apple pie - done right, of course - but my absolute favorite is peanut butter pie. It's even better with Peanut Butter Cups on the top. Yum. Peanut butter fluffiness in a crust. The only downside to loving P.B. pie is that not very many restaurants have it, and the only time I made it, it was a lot of hard work. Maybe it's just as well since I would eat too much of the pie all by myself. When my mother was pregnant with me and also after she had me, she really, really craved pumpkin pie. So much so that she would make it several times a week and because of that she started turning orange! She was breast-feeding me and because of that I have such a love of pumpkin pie now. It's my favorite! When I was 16, I was adopted by a -very- wonderful family, with a kitchen that was absolutely massive. My first day calling their house home, I set to work helping my mom cook all the daily meals. My first thanksgiving, I had a real bug up my bum to do something especially wonderful for my new family, and decided I was going to make a pie for everyone. I made a blueberry pie for my dad, a blackberry pie for my mom, and an apple pie for my new little brothers. I got my recipe out of a book, but I made everything by hand. I even picked the blueberries off the bushes in the yard, the blackberries from the bush in the yard, and I picked the apples from my best friend's tree. Pies have always been my favorite dessert. Thanksgiving at my parents house can sometimes boast of 14 to 20 pies...which works out to be 1 whole pie per person. My favorite pie is what my grandma called Dutch Apple pie; it's a single crust and you cook the apple peels to get this fantastic juice that you pour over the apples before baking the pie. Grandma used to make it for me for my birthday instead of a cake---I never knew how much work was involved until my mom gave me Grandma's recipe, handwritten by Grandma. I tried baking it once; it just wasn't the same. I haven't met a pie I didn't like :-). If I had to pick my favorite it would be chocolate meringue! Nothing tastes better, wet, salty and dry. I’ll come to your place every day if you’ve got ‘em. Thanksgiving and pies are melded together in my childhood memories. Pumpkin was always my favorite then. I was an adult before I had pecan pie. That beats pumpkin. Although I don't think there is a pie I would refuse. They are all good, especially for breakfast! Awww MAAAAN--Blogger ate my comment (I think). And I wrote a really long comment, too! But I won't re-type it, so, in sum: My MiL does all the pie-making in our house; a Rhode Island variety called Greenings makes the best apple pie; and I LOVELOVELOVE apple pie with melted sharp cheddar for breakfast. My first comment was lots better. Boo. When I was a young girl my aunt was the one who made the best pies. My favorites were the coconut cream and lemon meringue. My sister took over the pie making role and makes awesome pies. A few years ago she made the Thanksgiving pies. They looked so pretty. Then we cut into them. She forgot to bake the crust! She still hasn't lived that down. PS I eat apple pie for breakfast too! 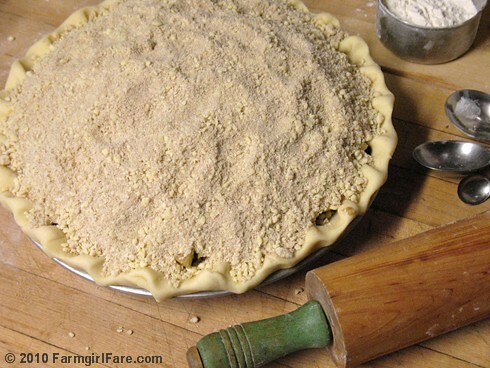 Could you share recipe/directions for Food Processor Pie Crust--and the all-butter crust? 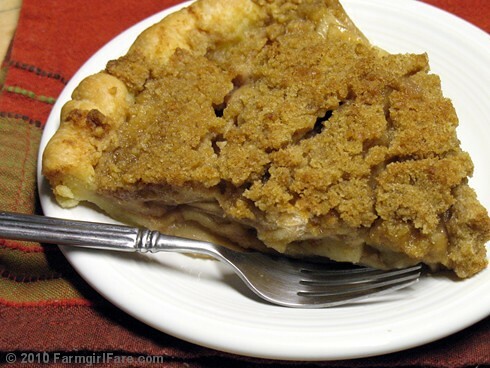 I love apple pie in almost any form, and would make lots more if crust was easier. I made my first 'real' pie recently, to surprise my husband for a job well done. I chose lemon meringue. I did an easy oil and flour crust (I know, not ideal), but had a great time whipping up the meringue and stirring the creamy, custardy lemon filling. When I put it all together and baked it, I was shocked to see that it looked just like a "store pie", with lightly browned peaks. It was tart, sweet, and perfect, and my husband loved it. Suddenly, I can't wait to bake another pie. Right...I'm blaming you totally for this...I'm about to turn off my computer and go make an apple pie right now with the cooking apples hanging on the tree outside my back door. That picture just looked so good. And I'm going to use real butter - lots of it - for the crust. Can I please come over for breakfast? I'll drive from NY for pie that looks like that, and I'll even bring treats for the donks! Did you know that March 14th is Pi Day? In case you are rusty on your math, Pi is the very useful (useful for calculating things like areas and diameters of circles, and pies are circles!) mathematical constant that starts with 3.14, hence March 14th is Pi Day. Last March I went to a Pi Day party and had some of the most wonderful pies. The standout for me was a Mushroom Pie or Sienipiirakka (really. It's from Finland). I love savory pies. The recipe is in "Sundays at Moosewood" if you want to try it. Beware of the pastry, it is sticky to handle but not only does it make a beautiful pie, it's delicious too. I have made it several times and it always gets raves. I'm sure it would be a good breakfast for breakfast but leftovers seldom last the night. Yummy Pie! Favorite: Pumpkin Pie (Libby's and betty crocker crust recipe), 2nd up: Apple Pie (Martha Stewart's Apple Pie recipe for the filling and betty crocker again for the crust recipe). Of course, you need to double the crust recipe for extra deliciousness. It's apple pie of course! My mother used to make four pies at a time (because they didn't last long between 7 people)! My father had the job of pealing the apples while mom rolled out all the crusts. And with the left over crust pieces we would roll them out and sprinkle with cinnamon sugar, cut into strips and roll up and bake as a treat. I make a couple pies at a time now - they are almost as good as moms. My DH can't work the peeler to save his soul but I bought one of those peeler/corer things and they work great! Autumn is apple pie time for sure! 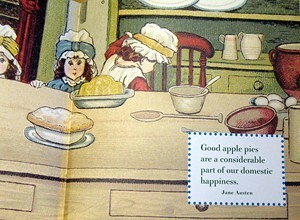 Well, I used to love strawberry-rhubarb pie, but then I had an apple pie with great big crumbs of struesel (sp?) topping and never looked back. I always make twice as much topping as called for because it's the best part, and I always bake the pie till it's dark golden brown on the tips cause I like it really crunchy. Mmmmmm, pie!!! My favorite memory is that my mother used to make at least 2 to 3 pies a week, so there was always a pie in the kitchen. When I was in High School, I would come home from my dates and have a midnight piece of pie before I went to sleep. What a wonderful memory... Makes me want to make an apple pie for myself. I love Jonathan apples for pies and eating, too. Count me in for your giveaway and thank you for your generosity. My mother made THE BEST lemon meringue pie in the world. The meringue was high and had just the right amount of golden on the tips, the lemon was tart and sweet at the same time, and it was never runny, Her crusts were always fabulous too. Really, it was the only thing she excelled at in the kitchen, but boy were her pies fabulous. Comfort foods - yum - ajnd a recipe for mushroom barley soup. What a score! 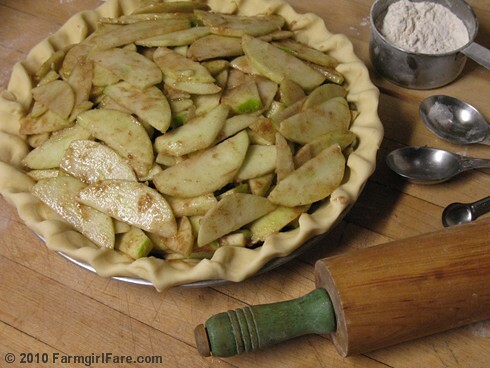 I didn't come from a cooking or baking family, so when I started dating my now-husband and found he liked apple pies best, I went through about 7 recipes before I found one that got a perfect score from him! My mother always let us have fruit pies (apple & pumpkin come to mind) for breakfast if there was some around. My husband thinks it's odd, but I don't care! Pie for breakfast! YUM!!! I love making pies so much that I make way too many for our stranded-grad-student Thanksgiving dinner. For some reason someone always brings a store bought pie and then has to take the whole thing home. I wonder why? heather dot frye at gmail dot com. Apple pie is my favorite, and I make it just like yours. I am not a fan of the double crust apple pie AT ALL. And I learned a few years ago the food processor pie crust trick. It's FABULOUS. Pumpkin pie is my favorite, with homemade crust of course. The food processor trick is the best. It's the only way to go. And the spice mix in pumpkin MUST be the one from the Libby's can (1 tsp cinnamon, 1/2 tsp ginger, 1/4 tsp cloves) or it just doesn't taste right, cause that's what I grew up with. When I was a kid, I loved pie crust uncooked. I'd eat the dough raw and was always begging for the scraps left over from lining the pie plate. My mother was a big believer that pie crust was either going to roll out and work, or not, and if not, might as well just throw it out and start over. One time she did while I was sitting on the counter in the kitchen (about age 4) and I remember thinking, hey, I would have eaten that! when i was little girl, before i had grown-up tastes to appreciate fruit, pecan or pumpkin pies, my parents, brother and i would occasionally visit this small restaurant in the town I grew up in. They always had a chocolate silk pie that was about a mile high, with a layer of whipped cream another inch high, all on a tasty crust........it was the big attraction for my brother and me, and we always begged for birthday dinners there........of course, half the time my parents would get their share, the pie was just too big for little tummies.....thanks for the memory trigger, i hadn't thought about that pie and the wonderful experience that went along with it, in years!!!!! I love Nancy Meyers' movies too. Food and decorating people both seem to love them. I am always hearing about people recreating the sets in their homes. I have to say, I never got the pastry in the food processor thing. To me, it is faster and more fun to make it with my hands or a pastry blender and mix in the water with a fork. It takes about ten minutes for me to make one and all I have to wash is the bowl (and wipe the flour off the counter). I tried the food processor and it took the same amount of time and made the same quality crust, but left me with a lot more to clean. People always rave about it, so maybe I am missing something. Perhaps I will try it again someday. I can't be in the contest because of where I live, but I'd like to share a pie fondly remembered from my childhood. I agree that the word "pie" is giggle inducing, for some silly reason =) How about flapper pie? Is that a kicker name or what? Google it and you will be directed to a recipe from allrecipes.com which is pretty close to my Mom's. It's a custard pie with graham cracker crust and meringue on top. Pie, such a comfort word in and of it's self. I'm another pie dough eater. When I was pregnant with my second child it was all I wanted to eat. Another pie story, I worked in a fabric shop and across the street was a small family owned frozen yogurt shop. On the weekends the owners mother would come in and make meat pies. Oh so lovely!!! If you worked the weekends you had to get your order in early or you were out of luck. Even all these years later my mouth is still watering with just the thought of them. Apple is my favorite fruit pie. I prefer a double crust but DH loves what he calls a Dutch Apple Pie which is like yours, with a streusel topping. I'll bet finely chopped walnuts would make a lovely addition to the crumble. I loved my Mom's apple pies so much that she made little 6" ones and sent them to me for my birthday. I really miss her and them. thank you and thank you for a great, great blog. Pie!!! One of my most favorite topics. I grew up with a mom who never baked and an aunt who was an expert in all things pie and cake related. With my aunt as my inspiration, about 10 years ago I decided I wanted to learn to make my own pie crust. Fast forward to today - I am the resident dessert expert of the family! I've also learned to make my own bread and lots of other wonderful things. But the best thing about this is that my 7-year-old daughter actually requested my pumpkin pie for her birthday one year! I've been tweaking and perfecting my pies forever, and there's always more to learn. The yummiest hobby in the world!! My favorite dessert is pie, cookies, cake in that order. I come from central PA. and it is pie, pie, pie, all kinds. Perhaps it is where I am from that I prefer crumb tops over two crusts. And shoo fly pie is not for dessert BUT for breakfast. Either kind, dry or wet is good, dry can be "dunked". Years ago my mom used to make something called a "milk pie". It was not exactly a custard. I hope to find the recipe some day. I wish I could relive the times waching my grandmother and mom in the kitchen making pies, and givng me little bits of cut off crust to make a shape and bake. I have a pie recipe that looks very similar to your apple pie in this post. I entered it in the baking contest at a local sausage festival. I earned 2nd place and got a trophy with a pig on top (because it was a sausage fest). Your mention of 'bacon pie' made me think of my pig-pie trophy. Thanks for all the fun farm pics. This perennial pie story favorite in my family hails from the Ozark Mountains of Northwest Arkansas, where my grandparents homesteaded on 150 acres from the early ‘60’s to the present. As anyone who has ever slaved over a hot, wood-burning cook stove can tell you, baking anything, let alone pie, requires skill and planning. My mother helped my grandmother that day prepare a much anticipated apple pie. Both women are well known among family and friends as being excellent cooks, so there was no reason this pie should fail to hit the mark. The pie was lovingly constructed, complete with fork tine holes punched decoratively on the top crust, and placed in the carefully heated oven to bake. Occasionally my grandmother would risk opening the heavy, cast iron door of the oven to take a quick peek and gauge the progress of the succulent pie baking within. After a few of these surreptitious glances, she called my mom over. “Mag, take a look at this pie. It just doesn’t seem to be cooking right.” My mom took a look for herself. The crust appeared to be browning up nicely, but there was no sign of the tell tale sweet, brown apple-y goodness welling up through those fork tine holes of the crust, indicating a successfully percolating apple pie filling. There was, however, an ominously sparkling crystalline sheen coating the top of the crust. After about an hour of this, they decided it was time to take the pie out of the oven, regardless of the lack of bubbling goodness. They let it cool, warily eyeing the crystals glittering back at them from the pie’s crusty surface. Eventually my mother mustered the courage to sample a bit of the recalcitrant pie. Grimacing as she spit out the mouthful of pie, she exclaimed to my grandmother, “It’s SALT! You grabbed the jar of salt instead of the sugar!” (My grandmother always bought her cooking ingredients in bulk and stored them in large, glass recycled pickle jars.) I’m not positive about this, but I’m pretty sure some tears were shed in that hot kitchen that day. This story has gone down in the annals of our family history as the tale of The Dead Sea Pie. My grandmother was a New Englander who always wore an apron around the house over her dress. She used to make apple pie for the holidays, and would put a plate of sharp cheese on the table too. She said it was to cut the sweetness of the apples! Thanks for the pie stories, I think it's time to bake! It always makes me feel better! My aunt had an apple tree in her yard, and my mom (her sister) and I would go help out making pies. I loved helping to roll out the crusts, and sneak tastes of pie dough. By the time we'd finish, there would be probably 6-10 pies for the freezer. YUM! Several years ago my boyfriend and I set out to make our very first cherry pie. We hit a local orchard in the morning, bought a cherry pitter later that day, and constructed the pie that night. It set up over night in the fridge and we enjoyed the surprisingly sweet/tart and magnificently RED pie for dessert the next day. The cherries were way more expensive than we thought they'd be and by the time we bought a cherry pitter we had invested about $35 in the thing. But, it has become our favorite pie and it is well worth the expense. We look forward to cherry season every year now. The pie that I make most often is buttermilk pie. I had a dream about my great grandmother making buttermilk pies and she told me the secret was a generous 1/4 of a teaspoon of cayenne per pie, and she was right! Adds a little smokey warmness. How can we talk about pie without mentioning the movie, "Waitress," with Keri Russell. I loved this movie, and I loved all the footage of pies, and I loved the last scene with the toddler. This movie made me want to eat, bake, and share pie. If you haven't seen it, go to your video store right away. I just made your "tomato-pesto-cheese pie with the biscuit crust" for a friend who just had a baby. It was a big hit! That recipe has become a staple at our house - Thanks so much! Probably my favorite family pie story is when my grandpa asked my mom to make huckleberry pie. For those who don't know, huckleberries are tiny little reddish fruits. They grow wild in Oregon (and I hear they grow other places too). They can be a bit tart, but they are very tasty. My mom said she'd make the pie if my grandpa picked the berries. He spent all day picking. He went to woods behind their house, sat in a chair under the bushes, and picked and picked and picked! He finally gave up, but there was just enough for a pie. It ended up being very tart and my grandpa never asked for one again! On Oct. 9 at our community Fall Fest, I received honorable mention for two pies in our United Way pie contest. The one was apple and the other was this yummy Coconut Macaroon pie. It mixes up in a flash and is really delicious. Happy pie baking. The apples are great this year. One of the best memories I have of my grandmother was her apple pie with a chunk of cheddar. Yum!! I'm a HUGE fan of making pie crusts in the food processor. People in my family love pies so much that we have them at weddings instead of cake. :) My favorite pie? For a cooked version, probably pumpkin, and for a cold pie- pink lemonade ice box pie. It was my grandmother's recipe. I make it on hot summer days to remember her. Do you remember the Purple Pie Man and Huckleberry Pie from Strawberry Shortcake – back in the 80’s? I loved those toys! I didn’t have any, but my best friend did. She had them all and I remember the Pie Man the best – he was the tallest of the figures and held a pie. All the figures smelled like their names. It was the only experience I had with pie as a child. Thank you for your website! I enjoy your pictures and stories and recipes! They really brighten my day! Just made two apple pies last night from apples we picked over the weekend. I am still a crisco crust girl - like my mom but do want to try using the food processor for my crust. One of the Moosewood cookbooks (Moosewood Desserts?) has the most awesome berry pie with a crust that has sour cream and puffs up some. My pie story was of a pumpkin pie I made (attemped to make anyway) last Thanksgiving. I am not a big fan of pumpkin pie, so I was determined to make the world's best..and maybe I'd like it. So I roasted fresh pumpkin in pumpkin beer, pureed it, and drained it in cheesecloth overnight. The next morning I simmered the puree w/a smattering of spices and a pumpkin beer reduction, then poured it into a lovely homemade shortbread cookie crust and baked it. When it was golden and glistenting and beautiful, I popped open the door and gleefully scooped it up for transport to its cooling rack...only for my cheap crappy Pyrex pie dish to crumble in my hands, golden pumpkin goodness oozing onto the oven coils. After which I promptly shut the door and tried to pretend nothing had happened for the rest of the day. However, I did manage to steal a glass-free bite, and it was divine. And I now have a very pretty and expensive red pie dish. I have 2 wonderful pie memories. The first is of picking pecans at my grandparents house in Central Oklahoma. They had 2 MASSIVE pecan trees in the back yard and my cousins and I would each take a grocery bag and run around picking pecans off the ground. When we were very little, each pecan had to be inspected by my Grandpa, to make sure it didn't have any wormy holes or anything on it. As we got older, we learned the difference between a good pecan and a bad pecan ourselves. Occasionally if there weren't enough pecans on the ground my Grandpa would shake the lowest branches of the tree and we'd all run for cover (and squeal with glee) as pecans came tumbling down around us. My Grandma would then take all of our pecans and bake pecan pies that we would enjoy at every meal for the rest of our stay at their house. It's one of my fondest childhood memories. My second pie story is very quick. Not too long ago I came across a fantastic idea of making Pie Pops. Little mini pies attached to lollipop sticks. I mean really, Pie Pops. Not only are they delicious but they are so cute!! Pie Pops!! My favorite pie is Pineapple Pie. My grandma used to make it for my dad every time we came to visit. Now my mom and my sister in law carry on the tradition! I grew up eating pie for breakfast. My mother said that it was a perfectly acceptable breakfast food because it has more fruit than Poptarts. At around 12 years old I baked my first pie, lemon merguine. When making the merguine I discovered there was no cream of tarter in the home. So I improvised and instead of making merguine I topped the pie with marshmellow cream. I'm happy to say my pie baking skills have improved greatly since then. My grandmother died a few months before I was born. If it hadn't been for Daylight Savings time (which, as a lifelong farmer, she thought was ridiculous), I would have been born on her birthday. She was known locally as a great home baker and I've always been a little sad that I never knew her or tasted any of her famous baked goods. So I was ecstatic when my mother came across Grandma's recipe box and I now have her recipes for sour cream raisin pie and "pumpkin pie, extra good". I like to think that maybe some of my love of baking comes from her and I'm very happy to report that her pumpkin pie (with its 2 cups of heavy cream) is extra good! My favorite pie story involves a dinner pie, not dessert, but still humorous (in hindsight). My son's all-time favorite pie is Asparagus pie. When he, my DIL and two granddaughters came to visit, I made not one, but 3. This was not because we ate them, but because I had a series of failures. Failure #1: Prebaked pie shell fell flat all over itself. In spite of beans and much fork poking, it just folded up and looked like something you don't want to talk about in polite company! Sprinkled cinnamon/sugar on it, and the grandgirls loved it, despite its looks. Failure #2: Second shell baked just fine, completed the recipe, broiled it to crisp the grated parmesan cheese on top, put it on the counter while we went out to check on whether any lambs had arrived or not. Because of the snow, my wussie brown dog (a boxer) stayed inside. She enjoyed 2/3 of our dinner. It did not sit well with her feather-weight digestive system, either, let me tell you! We had spaghetti instead that night. The next night, we checked for lambs BEFORE making dinner, and finally got our pie! Every time I make it I think of that visit, and how much fun it was! My Grandfather was a french-canadian blueberry farmer way up north in Lac-Saint-Jean, Quebec. So, I never actually had any other kind of pie, except pumpkin, till I got to college. I'm sorry to say I'm a blueberry snob - only the wild, low-bush blueberries can satisfy my palate! Thanks for this chance to enter your giveaway!! My ex-husband loved lemon meringue pie. He'd eat it any time of the day or night, he dreamed of it, he's speak of it in hushed terms. Once, when he was a boy, his mother had made one for her Bridge group, and he asked, "May I have some?". She told him yes, but, be neat about it so it would still look nice. When she brought it to the table, it was still uncut, and although puzzled, she let that go, and basked in the ohhhs' and ahhhh's of her friends, who knew of Ruth's prowess with this particular pie. She soon discovered her son had, indeed, taken 'some'. He'd lifted the meringue, scooped out most of the filling, and placed the meringue back on the crust... when she sliced, the whole thing collapsed. The best day of my marriage was the day he ate my version of her pie, got tears in his eyes and said...."I'll never admit I said it, but, your pie is miles better than my mom's"
I can assure you he was well rewarded for that compliment later on, when the kids were asleep. Will you puhleeeeeeease post the recipe for this pie??? You are killing me over here.